Set aside a little time for holiday shopping THIS Friday night while your children enjoy watching a holiday movie favorite, “Elf.” Plus, games, popcorn and hot cocoa are included! 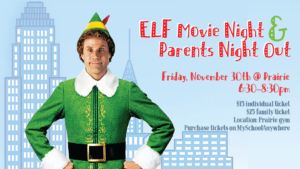 The Prairie PTA is showing “Elf” this Friday, November 30th from 6:30 to 8:30 pm in the school gym. Drop off your children in the gym and the 6th graders will supervise them for the evening. Purchase your tickets at $15 per student or $25 per family though My School Anywhere, return the order form sent home with students along with a check payable to the Prairie PTA, or purchase tickets at the door! Please send any questions to christinewhetstine@gmail.com. While this event has a fee all Prairie students are welcome to participate regardless of cost, please contact Mrs. Jones at kristenjones@smsd.org.